The picking of the grapes finished on October 30th with a small batch for our Contadino wine. This year we picked extremely anticipated for most of the plots. Although the season started relatively late with lots of cold weather, rain, snow and hail, the summer was hot and especially very dry. Little or no rain came in the fall and so the concentration of the grapes was accelerating to the point of vines shutting down in some plots or berries starting to show signs of over ripeness due to hydric stress of the vines. The grapes for the rosato were picked on September 24th, relatively late for this wine. The hydric stress of the vines slowed down the fotosynthesis and so it took 10 days more than average before the malvasia as well as the small parcel of Chardonnay were ripe. Easy picking in this period and with our “pied-de-cuve” which popped off perfectly, all seemed to work fine. Except for the fermentation! The grapes for our MunJebel Bianco were picked the first week of October, some 3 to 4 weeks earlier than average! My worry were the white vines which were shut down due to lack of water and the meteorological info with no rain for another period of at least 2 weeks. With the Ph of the juice being already very high and the possibility of the berries drying out with inevitable loss of fragrance and elegance in the wine, I decided to pick all the white grapes, calculating the average between initiating over ripeness and not achieved ripeness. A very strange situation for me as I do not like the concept of averages and approximate working and so the picking started strange, in a forced way. Not really the ingredients of a great vintage. During the picking of the white grapes we picked a smaller quantity of Nerello Mascalese to make a good “pied-de-cuve” for our Contadino. I took the grapes from the least stressed vineyard, higher up the valley at Barbabecchi “Cuttunaru” where the grapes were perfect and the cooler climate and more profound and richer soil didn’t stress the vines so much. And it started perfectly well. 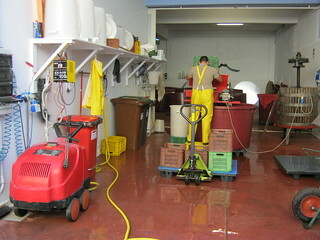 Peppe, the cellar manager, working through the grapes. The biggest batch of grapes for Contadino, MunJebel, and most crus of MunJebel, were picked between October 15th and October 20th. We rushed through nearly 30 tons of grapes in 6 days. The cellar was full with tubs in no time and we did long hours. A military, logistical operation which demonstrated our weak spots in handling bigger quantities of grapes and so we know what to change for next year, in order to be prepared for a much more complicated vintage. The lower vineyards suffered a bit from the lack of rain but as we moved up gradually to the higher plots, the grapes were much more balanced in terms of juiciness. 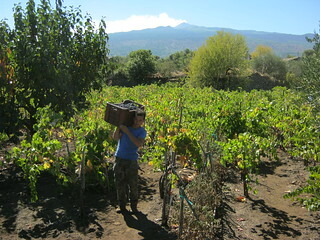 The grapes for Magma were picked on October 22nd and October 23rd. Very healthy grapes, with perfect ripeness, at least 2 weeks earlier than the average vintage. An unusual picking time and so I am very curious as to how the wine will become. Quantities were relatively low on the vineyards in the area of Passopisciaro due to the hail blast in March. Even though the buts of the vines were not open yet, the damage had been done and the production in our vineyards in that area has been reduced to one third in the end! Regarding the quality of the wines, it will be hard to say anything right now until these are finished fermenting. Our Nerello Mascalese are all old vines and they have handled relatively well the stress of lacking water as their roots are deep into the soil. But the stress has been evident watching the color of the leaves change over the summer. I feel it is far too early to be talking of the quality of the 2012 vintage at this point. It will be at least good to very good, depending on the type and style of wine and will also have character and expression. Wether this will be a great vintage like 2009 or 2011 I do not believe so. Although, it is better to wait for the wines to express themselves over the next 6 months before jumping to conclusions. This entry was posted on Thursday, November 8th, 2012 at 10:13 pm	and is filed under Releases & Harvest News. You can follow any responses to this entry through the RSS 2.0 feed. Both comments and pings are currently closed.